“I swear on Sershul monastery, these yaks are totally spoiled,” declares Locho in one unintentionally humorous moment of frustration. Locho and his wife and daughter are the focus of Summer Pasture, an independent documentary film about a nomadic family in eastern Tibet. Shot in the summer of 2007, this film is the rare documentary on Tibet that doesn’t have anything to say about the Dalai Lama, and it is neither a political protest piece nor a love letter to the noble yak herder.. Except for a few lines of text at the end of the film, its directors are silent and let Locho and his wife Yama speak for themselves . The biggest strength of Summer Pasture might be its choice of charismatic subjects who open up to off-screen interviewer Tsering Perlo about the intimate details of their lives. Locho, the patriarch of the family, is a fiery young man of the Kham region of Tibet who began herding at the age of six. As a child, his grandmother warned him against the evils of the city, and ever since he has been “following the yak’s tail.” In Locho’s eyes, the symbiosis of man and beast characterizes what it means to be a nomad. He knows that his tent and animals are his sole possessions, and that they are his only guarantee for survival. In the city he might have to beg, but “to work as a nomad is 100% sure,” he says. His wife, Yama, is less talkative. That may be partly because she is so incredibly busy: a normal day in Yama’s life involves rising well before dawn, milking the yaks (sometimes in the middle of a hail storm), collecting dung to burn for fire, cooking, cleaning and much more. “It’s not good to do nothing,” she says. “You should always be busy.” Only when she nurses her child does she stop for a moment’s rest during the day. Life is brutally hard and it is a challenge just to keep one child alive, but Yama laughs heartily and often. Most of the time it is her husband who makes her laugh. A sort of narrative arc comes emerges through Locho and Yarma’s storytelling: the façade of seemingly simple lives gives way to deeply personal stories of love, heartbreak, betrayal and ultimately the realization that major sacrifices will have to be made for a baby girl who has yet to be named if she survives her first few years of life. 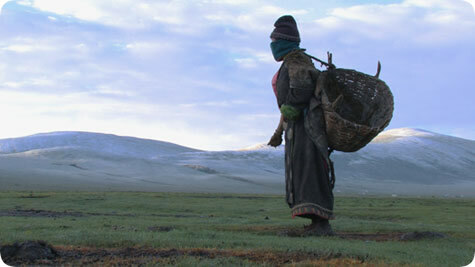 Khampa nomads like Locho and Yama move in circles to stay in place. Theirs is a thoroughly efficient, self-sufficient and systematic way of life, and in addition to its riveting storytelling Summer Pasture gives us a glimpse of the mechanics of Tibetan nomadism. It is a timely film, since this way of life may virtually cease to exist in Tibet within a few generations as more and more nomads succumb to the allure of urban living. Some of the adult situations talked about in Summer Pasture may not be appropriate for an elementary school audience, but middle school, high school and college instructors should find plenty of useful material here for talking about family and gender relations, environmental sustainability and Tibetan culture. College courses in anthropology, geography, environmental sciences and East Asia will find it particularly useful. Those interested in obtaining this film should contact info@khamfilmproject.org for information. 1. The Editors, 2010. “Meet the DocuWeeks Filmmakers: Lynn True and Nelson Walker—Summer Pasture.” Documentary.org, http://www.documentary.org/magazine/meet-docuweeks-filmmakers-lynn-true-and-nelson-walker-summer-pasture. 2. Gilles Deleuze and Felix Guattari, 2003. “1227: Treatise on Nomadology—The War Machine. From Modernism to Postmodernism: An Anthology.” In Lawrence E. Cahoone, From Modernism to Postmodernism: An Anthology. Blackwell 2003, 184. Mark Frank is a Ph.D. candidate in the Department of East Asian Languages and Cultures at the University of Illinois.